Public health messages aimed at boosting childhood vaccination rates may be backfiring, a new report finds. Current efforts that use scientific studies, vaccine facts and images and stories of disease-sickened kids actually increased fears about vaccine side effects among some parents. Even when they successfully refuted claims about a link between vaccines and autism, they made parents who were the most wary less inclined to inoculate their children. That's according to a study published Monday in the journal Pediatrics, which raises questions about the effectiveness of well-funded public health vaccination campaigns and the difficulty of swaying vaccine views, particularly when they’re entrenched. But anti-vaccination advocates say the study correctly spotlights the suspicion that some parents have for public health claims about vaccines — and their resentment of efforts to spin the message. “It is a big mistake for public health officials to assume that those resisting public health messaging about vaccines and diseases are ignorant, uneducated, ‘anti-science’ and that they lack social conscience,” said Barbara Loe Fisher, president of the National Vaccine Information Center and a frequent critic of vaccines. Michael Belkin, 60, a Seattle vaccine critic whose infant daughter died in 1998 after recommended shots, said parents want to make up their own minds. “People are skeptical about drug companies. Why should they not be skeptical about vaccines?” he said. Nyhan and colleagues looked at messages designed to reduce vaccine misperceptions and increase vaccination rates with the measles-mumps-rubella, or MMR, shots. They conducted two waves of email surveys of a nationally representative sample of nearly 1,760 U.S. parents of children younger than 18 in June and July 2011. Parents were asked about their vaccine views first, and later exposed to one of four messages: information about the lack of evidence that the MMR vaccine causes autism; a vaccine pamphlet about the risks of getting the diseases; photos of children affected with the diseases; and a first-person narrative from a mom whose son got measles. A control group also received non-vaccine related information. Overall, none of the messages increased parents’ intent to vaccinate future children, the study found. Those who supported vaccines still planned to get shots for their kids and those who didn’t weren’t persuaded to change. Information debunking discredited claims of a link between autism and the MMR vaccine successfully corrected parents’ views, but it didn’t budge their intent to vaccinate, the study found. In fact, among those with least favorable views of vaccines, the chance that they would vaccinate future kids fell from 70 percent to 45 percent. “As it was debunked, their objections started to take different forms,” Nyhan said. “If you are exposed to images or stories about sick children, it may be easier to bring to mind other ways children could get sick or face risks or harms,” he said. The study, which used existing materials from the Centers for Disease Control and Prevention, underscores the difficulty of communicating about vaccines, said Kristine Sheedy, the associate director who heads the agency’s efforts. Overall, the CDC spends between $8 million and $12 million each year on a wide range of vaccination messages focused on topics from childhood inoculations to flu shots for the elderly. While the vast majority of Americans favor vaccination — more than 90 percent of kids get the MMR vaccine on the recommended schedule — many have concerns about vaccine effects and a tiny minority — less than 1 percent — don’t vaccinate their children at all. Those parents may be the biggest concern. Health officials worry that growing pockets of unvaccinated children across the U.S. are behind an increase in measles, for instance, which was considered eradicated in America in 2000. Last year, at least 175 cases were reported in the U.S. Instead, parents who are questioning vaccination may be more persuaded by their own doctors than by government messages. That’s a view echoed by Dr. Ari Brown, a Texas pediatrician and spokeswoman for the American Academy of Pediatrics. She said an AAP survey found that the best approach with vaccine-hesitant parents was personal. But even doctors might not be as influential as parents’ friends and family, noted Emily Brunson, a medical anthropologist at Texas State University in San Marcos. 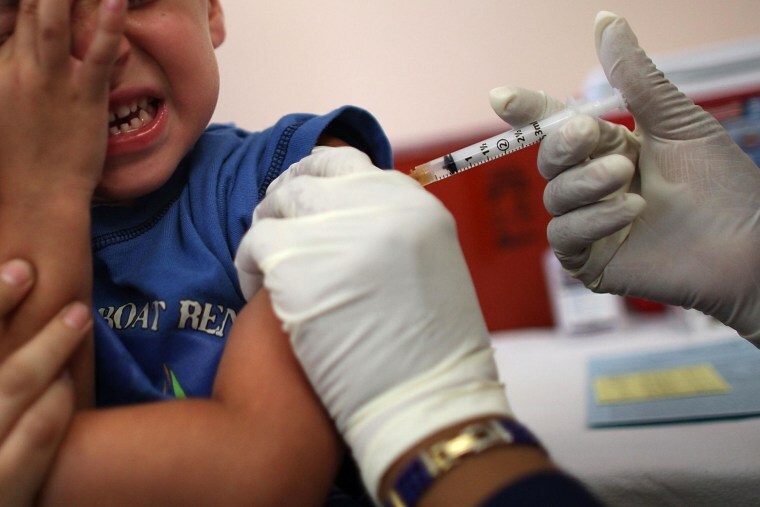 Her research shows that attitudes toward vaccination — positive or negative — are contagious. In one recent study, she found that if more than 25 percent of a parent’s peer group advised deviating from the government-promoted vaccination schedule, that's what parents would do. “It’s way more complicated than just going to your health provider,” she said. The new study reiterates the importance of testing the actual effects of public health messages before rolling them out to a wide audience, Nyhan said. More research is also needed to understand when parents actually make vaccination decisions and the best ways to influence them, Brunson added. But Barbara Loe Fisher, Michael Belkin and other vaccine critics resent the notion that parents who oppose vaccines need to have their views influenced or “corrected” — especially by government health officials. “That is counterproductive because most Americans are inclined to value freedom of thought and belief and resist being told what to think, believe or do,” Fisher said. And one other thing, added Belkin, 60, who is the lead singer and guitarist for The Refusers, a popular band that plays vaccine protest songs.